A Rinkya Blog: Sony & Swarovski Make Beautiful Music Together! 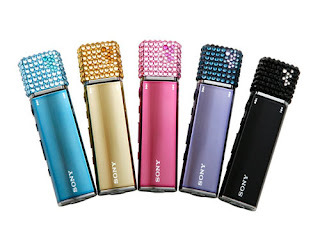 Sony's new Walkman Abiste E010 music players are adorned with Swarovski Crystals and a variety of colors to choose from- black, blue, gold, pink and purple. 1GB, 2GB and 4GB are the sizes available and a mini LCD will list what is playing. They will only be available in Japan and when they hit stores in September, Rinkya will announce on BuyRinkya for sale! Pick up the newest trendy colors and crystals that look straight out of Hollywood- but ONLY available in Japan.